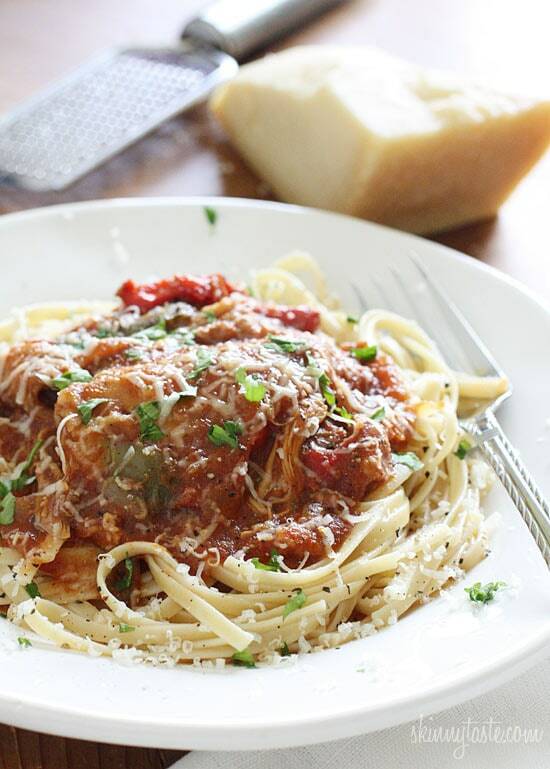 This family friendly Italian classic dish Chicken Cacciatore is made in the slow cooker for a convenient weeknight dinner! There is nothing better than the sweet aroma of bell peppers and tomatoes simmering slowly all day in this Chicken Cacciatore dish. Cacciatore means “hunter” in Italian, often the chicken is dusted with flour and fried in oil before simmering in tomatoes with onions and peppers. This healthier version removes the skin and skips the deep frying, but you won’t miss it. When using your slow cooker, I always recommend browning the meat and vegetables first for deeper flavors and a thicker sauce because liquids don’t evaporate in the slow cooker. But for those of you who don’t want to dirty a pan, or don’t have that extra time to brown first I tested this out using the quick method of dumping it all in the slow cookers. Verdict: The sauce wasn’t as thick as I would have liked, so my easy fix: I set the crock pot to high with the cover off for one additional hour to let it simmer and thicken and that worked fine. Perhaps adding a little flour would also help it thicken. If you want to add mushrooms to the sauce, this would also be a great time to do so. If you like white meat, you can certainly use chicken breast but I highly recommend keeping the chicken on the bone. The bone is what gives you such great flavor, you can always remove it after. We love it served over pasta, spaghetti squash, rice or polenta. For the stove top version, see Chicken Cacciatore. Cooking on the stove differs from the crock pot, liquids evaporate quickly on the stove where as in the slow cooker nothing evaporates. When you add all the elements to your crock, you may be tempted to add broth but don’t. There will be plenty of liquid once it starts cooking. Also, flavors tend to get muted in the slow cooker, so I always adjust my herbs and seasoning in the end to get it where I want it. 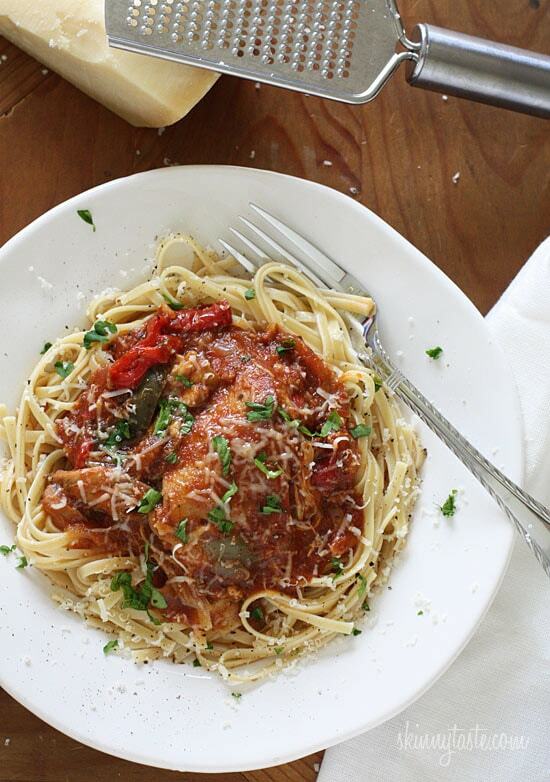 I’ve also now included an Instant Pot Chicken Cacciatore recipe. Enjoy! Season chicken with salt and black pepper and place in the slow cooker. Pour tomatoes over the chicken, top with onions and peppers, add oregano, bay leaf, salt and pepper, give it a quick stir and cover. Set crock pot to LOW 8 hours or HIGH 4 hours. When the timer beeps, remove lid and keep the crock pot on HIGH one hour to help it thicken. Heat a large skillet over medium-high, lightly spray with oil (I use my Misto) and brown chicken on both sides a few minutes, season with salt and pepper. Add to the slow cooker. To the skillet, spray with a little more oil and add onions and peppers. Sauté until juices release and the vegetables become golden, a few minutes.Add to the slow cooker. Pour tomatoes over the chicken and vegetables, add oregano, bay leaf, salt and pepper, give it a quick stir and cover. Set crock pot to LOW 8 hours or HIGH 4 hours. Remove bay leaf, adjust salt and pepper and enjoy! * Pasta not included in nutritional info. Making this tomorrow night for dinner. When I put it in the recipe builder in the Weight Watchers app, it calculates it as 7sp, not 5sp. Did I do something wrong? If it hasn’t been mentioned–and I have probably commented on this on other recipes–a cornstarch/water slurry (equal parts) is the easiest way to thicken any sauce. For something in the crock pot, I usually remove the meat from the sauce and put it in a dish. If you use chicken on the bone (thighs really are best in the slow cooker), you can take the bones out easily, and cut the chicken into bite sized pieces. Most crocks can go in the microwave, so stir in 1Tbs each of cold water and cornstarch (mixed together before adding), put the crock into your microwave, and cook it for several minutes, then stir it and check the consistency. You can add additional slurry if needed. Then put the chicken back in and it’s ready to serve. I finally made this today for the first time and I can’t believe I waited so long to make this! this is absolutely delicious! I used boneless skinless chicken thighs instead and I did the prep on the skillet beforehand as recommended. Amazing! CANT WAIT to make this again! Another A+ recipe from Gina! How well will this freeze? I’m cooking for two at home and one 19 year old college student who comes home to take precooked entrees back to school. Sure, it would be great and I am happy you are enjoying them! Gina, we’re not fans of bell pepper but I still really want to try this dish! Would simply omitting the bell pepper affect the dish consistency too much? Or is there an adjustment to the other ingredients I can make? Thank you! It will change the taste, maybe add a half without cutting it just for flavor, then discard it. Will definitely be making this again and again! I wonder if adding zucchini noodles to this dish while in crock pot would alleviate the need for pasta OR would they get too limp so better to do on stove and put cacciatore over? Can this be adapted to make in the IP? I made this for dinner last night and it was a huge hit! I’ve never made Cacciatore before because my family doesn’t like bell peppers. Or so they thought…This was so quick and easy. Thank you! Here’s an idea that only takes a few extra minutes: Before placing chicken in slow cooker, line a broiler/baking pan with non-stick foil, spray a little oil on the chicken with your Misto and place under the broiler until brown. Voila!! Browned chicken and no extra clean up. Can you do this with boneless chicken thighs? Could this be converted to use with an instant pit? First time ever using a crock pot and this turned out great! I’m not here for diet recipes but a quick google search for “crock pot chicken” led me to this recipe. I followed the recipe and set for 8 hours on low. Ended up falling asleep and cooked for 9 hours before oulling the lid off but it still turned out amazing. Only had to add a bit more oregano and some fresh chopped basil. Can you prep day before up to the point you put in slow cooker? So yummy and easy! Rather than pasta, I served over zoodles. A definite repeat! I hate bell peppers – what do you think would be a good sub that didn’t detract from the flavor? 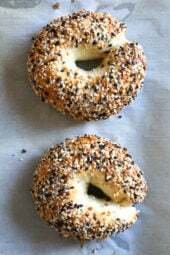 Put them in as large pieces (don’t dice) so you can remove them before eating. What is it in Smart Points? Stacy! Yumm! How would you adapt this for the Instant Pot? I made this tonight (shortened crock pot version with skinless boneless thighs). The meat was falling apart & the sauce tasted fantastic. However, I could still taste the “plainess” of the meat under all the good sauce – like the flavors haven’t penetrated the chicken at all. I’ve found this before with other chicken recipes that the chicken has sat in flavorful liquids all day but still tastes plain underneath the sauce. Am I doing something wrong? Slow cooker is certainly different than cooking on the stove. I find seasoning the chicken overnight (salt, spices) helps a lot! I am wondering how you would change this recipe to use the instant pot? I love all of your recipes and purchase kitchen gadgets based on what you use. Thanks! Not wanting to the store for ingredients I didn't have. I had all the stuff for this. I had some frozen chicken breasts so I used those. We also only had diced tomatoes. So I put them in my boyfriends mini blender and added some tomato paste and a little red wine we had. I'm excited to try it and so it my boyfriend. So easy to make and delicious. can you make this in a smaller crockpot ? 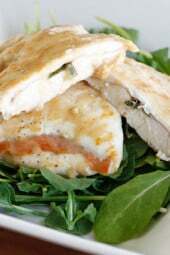 This recipe is very good and one that I use a lot. However, one thing I do differently is that I add the bell peppers about an hour before I am going to serve it. Otherwise, I've found that they get very soft and have an off putting consistency. 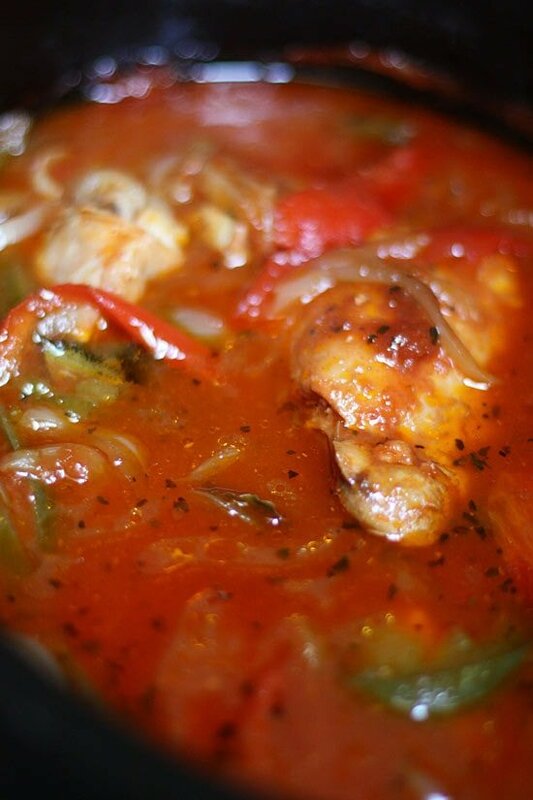 I have made this many many times, throwing out my old recipe for chicken cacciatore! I always use skinless thighs with the bone in. The flavor is always with the bone!! It is easily removed when the chicken is done!! As a receptionist for Weight Watchers, I have passed along this and many other recipes from Gina's web site!! Love Love Love!! Thanks Gina!! I too am wondering what size chicken thighs you used. The bone-in with skin ones I bought were about 8 oz each. The thigh alone is WAY more than the calories you have listed. Agreed. I got my thighs from Sam's Club and they worked about to 5.6 oz each, and based on calories for chicken thighs online, this works out to about 333 calories, just in the chicken. I am a little concerned about this. My family loved this recipe. It actually tastes just like my Gram's Italian recipe. I personally like the "soupy" sauce, it went well over pasta. Just made this today. It came out amazing! "If you are a white meat girl"
REALLY? You only expect women to use your site???!!! Lol, don't lose out on a huge market of male cooks that are looking to cook healthy. Delicious! Loved how the chicken fell right off the bone- no shredding required! Hey Gina can we mix in some boneless chicken breast too I am going to try it! This is totally delicious and very easy even following the "better" method. However, I used only red pepper and I roasted it — YUM! I also sauteed some carrots in the skillet I browned the chicken in and then threw them in the crock pot for the last half hour or so. Added some healthy bulk and the sweet carrots in the rich sauce were SO delicious. I serve this over either a Parsnip Puree or Cauliflower Mash and everyone in the family loves it. Love this recipe! I eat it over spaghetti squash. Thank you Gina for this wonder meal! Made it tonight and my bf loved it! I made it with boneless/skinless chicken thighs instead but was still very flavorful! Also, I agree with your verdict, the sauce wasn't thick even after adding mushrooms in the last hour. I just took out excess tomato juice and the problem was solved! Super delish with lots of flavor! Thanks again! I made this recipe on Saturday for a romantic dinner with my boyfriend. He could not get enough of it! I added sliced button mushrooms, crushed red pepper and garlic to the crock pot and finished it with a hand full of chopped fresh Italian parsley. I served in over whole wheat rigatoni pasta with a spicy arugula salad. Simple for a weeknight meal yet impressive for a group or special occasion makes this dish a "make again" in my recipe book. can I put boneless skinless thighs in frozen? I do that a lot for certain recipes. Has anyone tried it with this one? Love love love this! I had it with spaghetti squash and it was delicious. Made this over the weekend, using breasts instead of thighs and adding fresh mushrooms. I also used more peppers than called for in the recipe and added some Italian seasoning. Served it over whole wheat linguine and it was delicious. My family loved it. I will be making this again. just started the true crockpot version (no browning) with skinless boneless thighs. i have an aversion to touching raw meat. we're also trying to be healthier, so i buy skinless and the bone-in variety had all kinds of skin that I wasn't about to touch. whole wheat pasta noodles have been bought. dinner will start smelling awesome in a couple hours. i hope it tastes as good as the recipe predicts. Can I use chicken breasts instead? Would the cooking time change? 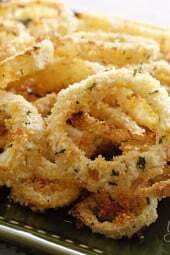 Would like to see some low sodium recipes. Just wondering about how much your eight chicken thighs weighed? My eight thighs weighed 2 lbs, 9 ozs… and a single serving came out to 10 ppv when I figured it using Weight Watchers' Recipe Builder. The only extra thing I added was a 16 oz. can of diced tomatoes. My point plus count is BEFORE noodles — quite a difference from the 4 ppv you posted! My husband and I loved it, however. I made this on Monday and both the hubby and I loved it. If possible, it tastes even better as leftovers. We served this over no yolk noodles and a little grated parm. Your site is amazing and I have tried a few recipes (including the pulled pork – another hit btw with my brother and friend). I love that you give the WW points as well. I'm gonna use drumsticks for this tomorrow, they're thawing now & I'm so excited! I have two or three cans of STEWED tomatoes… Should I just put them in a blender to smooth them out? Do you think I'd do better using pasta sauce instead? I also have a small can of tomato paste…but I can't go back to the store anytime soon. Please! Advice anyone? Just finished putting this in the crock pot. I've made it once before and it was DEE-LISH !!! We had pasta last night so I'm going to serve it over brown rice tonight….. Already looking forward to supper. This was so good! I doubled the recipe thinking I'd freeze half for later in the month, but we ended up just eating it all week long! We'll definitely be making this regularly. Thanks!! I have only ever seen Tutorusso crushed tomatoes with basil, is that what you use? How many chicken breasts did you use? Absolutely Delecious! I loved the depth of flavour the sauce got as it blipped away slowly.The only adjustments I made was to add a couple cloves of minced garlic and a pinch or two of red pepper flakes,other then that..perfect! I made this today for dinner – SO GOOD! My mum got me a crock pot for Christmas and it has been the greatest addition to my apartment. Rather than plain crushed tomatoes, I bought crushed tomatoes with garlic and herbs in it (in addition to the bay leaf and oregano already in the recipe). It definitely adds a boost of flavor to what some are calling a bland meal. I recommend! Another winner, Gina. We really enjoyed this dish. Amazing!! I love to cook but am constantly "editing" recipes to make them WW friendly! Your site has changed my life!! I used boneless/skinless thighs, extra onions, different colored peppers and a hint of crushed red pepper . . . so good!! There hasn't been one Skinnytaste recipe that wasn't most excellent! Thank you!! I am a fairly new cook and so far have had bad luck with other sites. I made a lot of mediocre recipes last year! I am very grateful to have found this site because your recipes are tasty and easy to make. This recipe is really good — I followed it exactly (long method; on high for 4 hours). Next time I think I will add more oregano though for a little extra flavor. I can't wait to make this again. Thanks! We LOVED this recipe! We had been making regular (stovetop) chicken cacciatore and it was really good but decided to try the crock pot recipe. Well we are never going back to the stove top now! The crock pot made the thighs SO tender, they just fell apart. This will be a regular in our house!! I had some chicken breasts in the fridge I had no idea what to do with and wanted something new. I happened to also have some cherry tomatoes and mini bell peppers from a veggie platter from Christmas. I chose to brown them because I know chicken breatss can be rubbery if just thrown in the crock pot. I also added a dash of garlic salt, and salted and peppered both the browning chicken breasts and the veggies liberally. Since I only had a few cherry tomatoes, I used a can of tomato sauce and threw in a few baby carrots just cuz I like veggies. When it was near finished, it did seem a little watery and bland, so I threw in an additional tsp salt and a second can of tomato sauce to thicken it up- turned out great! The chicken breasts had none of that rubbery-ness to them that they get if not prepared, and shredded really nicely in with the veggies and sauce. Glad I found this recipe! I always cube my chicken BEFORE cooking, otherwise it ends up looking like the above photo – strings of garbage on a plate! I made this yesterday and was very disappointed. It didn't have much flavour and I even browned the chicken, peppers and onions. Just recently made this and it was delicious! I made 10 chicken thighs (it was a value pack that was on sale) so I put extra vegetables and portioned it out to freeze the extras. I also added mushrooms during the last hour that you cook without the lid and red pepper flakes because my husband and I like a little heat. Other than that, pretty much kept it the same. Served over egg noodles. I do agree that you need to add a bit more seasoning (salt and pepper) before serving. Another thumbs up. Alright now.. when do you remove the bone? Individually on the dinner plate? I have a whole chicken which I need to use up as it expires tomorrow – just wondering if I can cook a whole chicken in a slow cooker or should I do it in the oven first and then shred the chicken up and cook with the remaining ingredients. What do you think? Adding a packet of Goya Sazón adds even more yumminess! We made this recently and it was FANTASTIC! 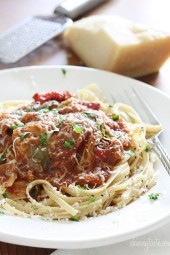 Favorite Chicken Cacciatore recipe as of right now. So easy to make and absolutely delish! Gina,you may have already answered this in a previous post but I didn't see if you did. If I used bone-in chicken breasts would that still give the flavor that the original recipe does? Just curious, since we aren't dark meat fans. I use boneless chicken breast abs it turns out great! Me, too! I did add some extra veggies so maybe that helped it stay moist? It was delicious! DELICIOUS! My husband and I loved this meal. I especially loved getting all the vegetables in with so much good flavor. I want to make this on Saturday for 10 college students, and I have a 5 quart crock pot. Should I plan to use 10 thighs and some extra veggies in the crock pot? That's what I'd prefer for ease of clean-up and because the rest of the day is busy. Also, what are some sides that would go well with this meal? I'm planning to serve it with rice, but I think I need to serve one or two more sides to make sure there's enough to go around. (I'm planning on apple crisp and ice cream for dessert.) Thank you! Gina, I love using your recipes! See my review below but I used 10 thighs because that's what came in the value pack and I added more vegetables – 1 green peppers, 1 red pepper, 1 onion, and I also added mushrooms at the end. It was perfect. I served over egg noodles, but rice is great. Could you tell me what size crockpot this is made in? Hi Sandy, I made this recipe several weeks ago in a 5-quart crock pot and it worked well. Would love to try this recipe, would a whole cut-up ckicken work? My family is picky and we all eat different parts of the chicken. To everyone that has cooked this recipe…will a 6 quart crock pot work? I made these last week and everyone in my house loved them and I am the only one trying to lose weight. I love coming on this site and finding new things to make. Everything I have made has been a huge success. I never knew losing weight and eating right could be this easy. I served this over rice (because I forgot to buy pasta and didn't realize until it was way too late!) and it was DELICIOUS. Used chicken thighs, and they were falling off the bone as I was serving it. looooove it!! I just made this last night, and it was great! So incredibly easy to make, and a BIG hit at home. LOVE your slow cooker recipes!